Donald Bradman is a former Australian batsman, and one of the most worshipped player in the history of cricket. He was born on August 27, 1908 in Cootamundra, Australia. He was a Right-hand batsman and a Right-arm leg break bowler. His batting redefined the game of cricket and his brilliance confounded opponents. For all his achievements in the cricketing world, Sir Donald Bradman is undoubtedly, one of the greatest players to have played the game in the 20th century. When Bradman started playing cricket, he invented his own solo game. He used a cricket stump as a bat and a golf ball. A water tank, mounted on a curved brick stand was present in the back of his house. When he hit the curved brick facing of the stand, the ball would rebound at varying angles at high speed, thus developing his concentration and timing. However, he had a poor debut in the test against England at Brisbane in 1928, he made just 19 runs in his debut match. After a poor start, he made a strong comeback and ended the series on a high with 468 runs at an average close to 67. Bradman showed his dominance in the 1930 series against England when he amassed 974 runs at an average of 139.14, including two double hundreds and his career best score of 334. The world saw a glimpse of Bradman’s calibre in this series and he didn’t fail to amaze them with his charismatic batting in the coming years. 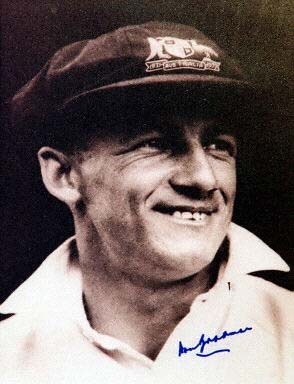 If there is one number that exemplified Bradman’s cricketing career, it is 99.94, his average in test cricket. Bradman scored 6996 runs in 52 Test matches (80 innings). He scored 29 Test centuries, which was a world record at one time. He also scored 13 half-centuries and 12 double hundreds (the most by any batsman). Bradman’s ratio of hundreds to fifties was a staggering 2.23. He scored a hundred every two tests. Bradman’s stats are even more remarkable because of the eight years he lost due to the World War 2. In the 15, Tests he played after the war, he averaged more than 105, and scored eight hundreds. He holds the record for the highest rated test batsman in the history of cricket with 961 points. Bradman’s record of 974 runs in a series is the most by any player in test history. The second World War ate up into Bradman’s cricket career and when cricket resumed in 1946, he was in poor health. The 1948 tour to England was his last and he led a team of such remarkable players that they were nicknamed “The Invincibles”. Coming out to bat for the last time, he needed just four runs to reach the average of 100 but was dismissed for a duck. Such was the shock among the cricket analysts and the public that they remarked this moment as “God’s Blob”. He died of Pneumonia on February 25, 2001. He may have died but he will surely be one of the greatest batsman to have played the game of cricket. Can Kohli be called a greater batsman than Bradman? Is Virat Kohli greater than Sir Don Bradman? Former England skipper Illingworth confident that Kohli's men may pull off a "Bradman"